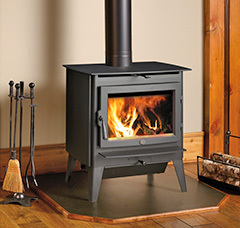 Serving Jackson, Volcano, San Andreas, Ione, Lockeford, Martell, Drytown, Sutter Creek, and the surrounding areas in Amador & Calaveras Counties, our fireplace & heating stove experts help homeowners find the best wood stove, gas stove, or pellet stove for their heating needs. A free standing stove, in its simplest form, is steel, cast iron, or soapstone container constructed to hold fire and radiate heat. In a time past, that was just about all, they were. They have come a very long way, especially in the last 30 years! 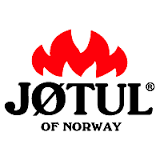 Now you can fuel them with either Wood, Natural Gas, LPG (Liquid Propane Gas), or Pellets. You can still get them made of Steel, Cast Iron or Soapstone but they are made with such care and precision that they are now a beautiful piece of furniture in your home. They don't have to be that ugly black box stuck over there in the corner! Now they can be painted one of a wide selection of colors, they can be coated with a high gloss porcelain enamel, you can get it with a black door, a brass door, a nickel door and you can go with a pedestal or black, brass or nickel legs. The old stoves were also not very efficient and they contributed to the air quality problems that so many areas have. Some of the old stoves could put out a lot of heat but they also used up a lot of fuel to do it. Where the old stoves mostly operated a 30 to 40 percent efficient, the new stoves are now up to 82 percent! This means you are using much less fuel and creating much less pollution to be able to heat your home. A Free Standing stove also has the benefit of being able to go almost anywhere in your home so you can zone heat and save fuel that way also. If you have a room that your large stove just won't heat, you can add a small stove to just warm up that room instead of running the whole house heater. So as you can see there are a lot of choices to make but at Sierra Hearth and Home we have the knowledge and the experience to help you through those decisions. Please come to our showroom and see our wide selection of wood, gas and pellet stoves and talk to our friendly staff about your needs! Enjoy the smells, sights, and sounds of a wood burning fireplace but with the benefit of better heat output, higher efficiency, and fewer emissions. Wood heating stoves have efficiency from 75% to 80%, and some high performance units can heat a home as large as 2,100 square feet! We offer a wide range of wood stoves from utilitarian to modern & sophisticated, and many wood stoves can burn for up to 10 hours on one load! 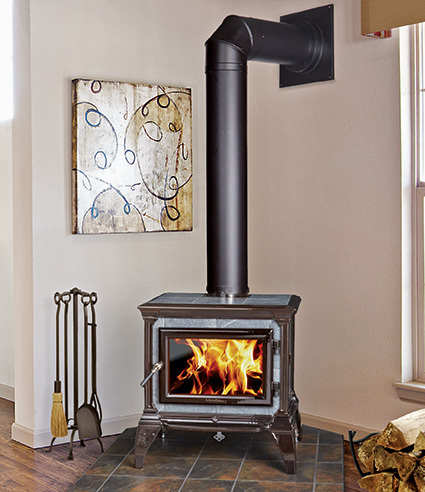 More convenient than a wood burning fireplace, these contemporary appliances come with the convenience of an automatic ignition system so that you can light a fire in your wood stove at the touch of a button. Thanks to their high-tech, closed combustion system that boasts better burn time, you will have less clean up than a fireplace. Gas stoves are a wonderful addition to any home and offer a wonderful & smart alternative to traditional heating methods like a furnace. Choose from propane or natural gas and increase your heat efficiencies by up to 87%. No need to worry about storing & stack logs, cleaning ashes, or having your chimney cleaned yearly. 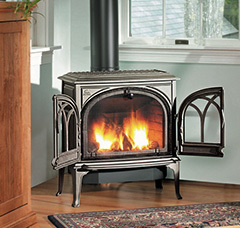 A gas stove is a convenient heating appliance that is clean burning, beautiful, and timeless. 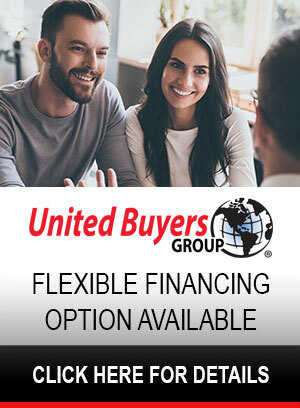 Whether you are looking for an eye-catching addition to your favorite space or a true, heating power house that can warm houses up to 2,000 sq. ft., a gas burning stove is the perfect option. Pellet stoves are an eco-friendly heating option that have become extremely popular in recent years. 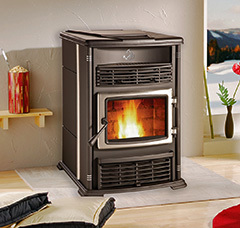 Pellet stoves are incredibly efficient heat sources that can effectively warm large rooms or even your entire house. Wood pellet fuel is recycled & renewable and can be stored easily unlike firewood which will leave a mess behind. Load the pellets into your stove's hopper and enjoy up to 36 hours of continuous operation without once needing to tend to the fire. A steady, warm heat will radiate throughout your space and keep you cozy on the coldest winter days.